and, do I use blinds? This is a great question From Kevan that I received via the contact form on my website. And, it’s a good question to discuss here. What is the “Ask Brian…” blog series anyways? In an effort to make myself more accessible to photographers who follow my photography I started a blog category titled “Ask Brian…” In this blog series I’m going to be answering as many of your questions about landscape and wildlife photography as I can. I should warn you ahead of time that I’m probably not going to have enough time to answer all of the questions I receive. However, I am going to do my best to answer as many as possible. If I miss somebody’s question I want to apologize to you in advance. Nice one Kevan! And, you’re welcome. This is great question too. And the answer is a pretty easy one for me. I don’t use blinds or camouflage in wildlife photography. I think that wearing camouflage and using blinds in wildlife photography is a excellent thing to consider if you want to get really serious about that genera of outdoor photography. And, it is practically the only way to get really close to some animals in the Wild. Let me explain why I very rarely use camouflage. When I was about 16-26 years old, I used to frequently hunt recreationally in the Canadian province where I grew up, Nova Scotia. Early on in my youth I naturally gravitated towards outdoor sports including camping, hiking, climbing, and seasonally hunting and trapping. Fast forward to the present and I don’t hunt or trap anymore with a gun, but I do with my camera. The valuable lessons I learned, and the skills I developed around wildlife behaviour while I was an active hunter and trapper have proven to be valuable in wildlife photography. The stalking and concealment skills I learned when I used to hunt have transferred over well into my outdoor photography seamlessly. I believe I’m a better wildlife photographer today because I grew up hunting and trapping. What I learned from stalking animals in the past is that when animals can see you and keep an eye an you, they tend to gradually accept you and relax a little more. This is relative to stalking them and jumping up to snap a few photographs. After they relax their true Natural behaviour starts to shine through. This is when you can get some excellent behavioural photographs that tell a great story. But, when I wore camouflage while duck hunting I was a little shocked at just how close I could creep up on the animals that I hunted. Now, fast forward ten years from when I was a duck hunter and I was now working for Ducks Unlimited. Part of my job with Ducks Unlimited as a waterfowl biologist was to get a “visual” on female Mallard ducks with their clutch of ducklings before they fledged. This was sometimes hard to do because some of the female Mallards where very wary. When my bosses found a duck that was really hard to get a visual on they always sent me in with a telemetry kit and my camouflage. And, I always came back successful. I could creep up very very close to the wary ducks to get an accurate visual and clutch count using my camouflage. This definitely applies to wildlife photographers as well. close the distance between you and your subjects! If you want to give camouflage a try then buy some and give it a go. 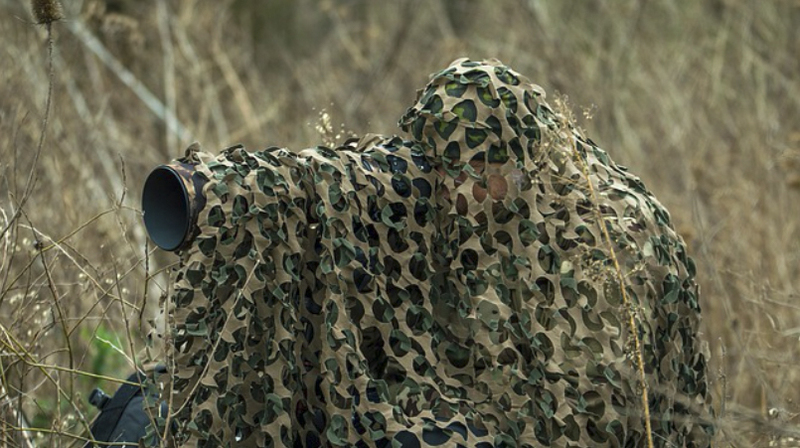 You can find a wide variety of camouflage gear for sale at Bass Pro Shops or at Canadian Tire Corporation. Better yet, visit your local small outdoorsman supply shop and ask for advice. The small local guys will be eager to help you. And, the local experts might give you the best tips on where to find the best wildlife viewing spots too. Generally, I don’t use blinds in wildlife photography. I live in the Canadian Rockies where the wildlife in the National Mountain Parks here are habituated towards people. People can simply drive up to the wildlife and photograph them from safely inside of their car. I don’t use blinds anymore because the locations where I photograph wildlife. However, outside of parks wildlife is often wary and difficult to get close too. In situation like this I have used blinds in combination with camouflage in the past and I’ll consider using it to photograph wary wildlife in the future too. The problem with using blinds is that you have to construct them or find a suitable nature blind. Then you have to sit in it motionless for long periods of time. My wildlife shooting style tends to centre around covering a lot of ground in my car and finding the wildlife, rather than waiting in a blind in a good spot and waiting. So Kevan, I hope that this answers your question adequately. Thanks for submitting this excellent question. I hope our paths cross again in the future!